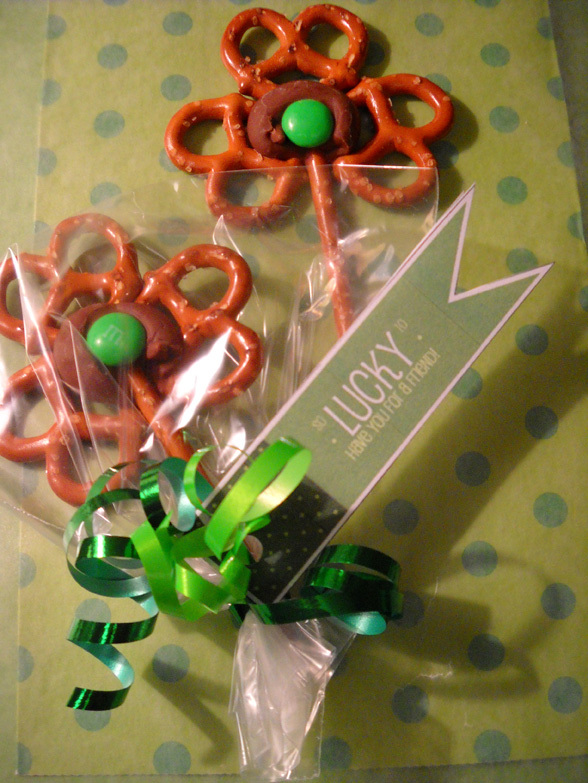 Visiting Teaching Pinspiration: Twisted Shamrocks! (P)INSPIRATION FOR VISITING TEACHERS: PRINTABLES, QUOTES, VIDEOS, & MORE! Baking sheet, foil or parchment paper, oven, a bag of pretzel sticks, a bag of mini pretzels, a bag (or so) of Hershey's Kisses, a large bag of M&Ms. Ack, who hacked my account and posted that blurry pic?!! Repeat until you run out of room (or Kisses). Carefully put baking sheet in oven so pretzels don't slide out of alignment. Press the end of a pretzel stick into the center of the softened Kiss for the stem. 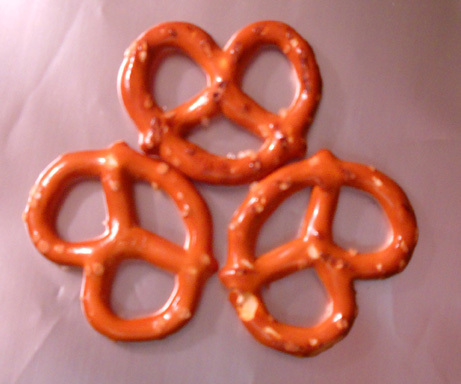 If the pretzels slide out of place, gently push them back toward the center. Use another pretzel stick to push them so your fingers don't get hot. 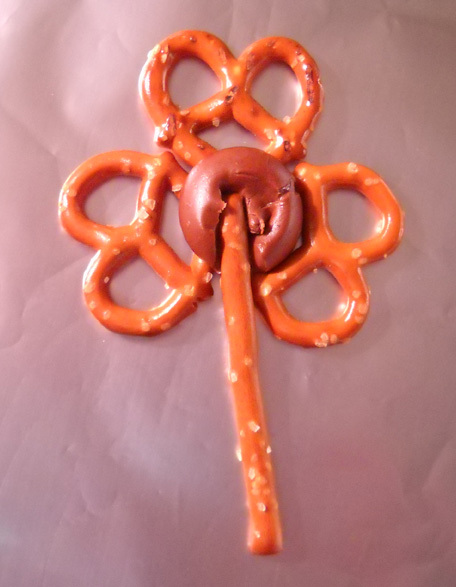 Press an M&M over the end of the pretzel stick--you want the Kiss to moosh around the pretzels, cementing them together. Wrap up in a goodie bag. My store was out of the bags, so I cut the zip off a ziplock bag. Print tags, tie, and present! Download "So Lucky to have you as a friend" tags by clicking on the image. Click on the resulting image to enlarge it, then right-click it to save to your computer. And no, I actually didn't forget half the page. It's my brilliant idea for you to fold the paper so you only have to cut the tag out half as much. Yup, I even re-did it so it could be that way. "Best-ideas-right-before-the-deadline" routine. Again. But hey, it's still St. Patrick's Day, so all's well that ends well. Thanks so much for letting me know! You made my day. Thanks--I think you are so clever combining those two ideas. When these are wrapped, they might be hidden around as a St. Patrick's Day scavenger hunt, finding as many lucky clovers as you can. They look enough like a Girl Scout Trefoil that I think my troop will enjoy making these. I quit blogging and didn't see your message until now. I think that's such an amazing take on this idea--I never would have thought of it. Thanks! 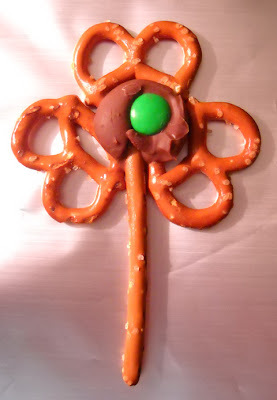 Just came cross your fabulous idea on Pinterest and am planning to make these tonight as a fun treat for the Notre Dame vs Alabama bowl game tomorrow night. Love love love your humor too! Andrea, what a great use of this idea! Yet another idea I wouldn't have thought of myself. Thanks for commenting and leaving an extra-added bonus suggestion for others who might visit later. The reason I removed your comment was to protect your email address from spammers. I hope that's OK with you! Thanks again! I am going to make these tonight with my 7 year old son. He will enjoy this food project. 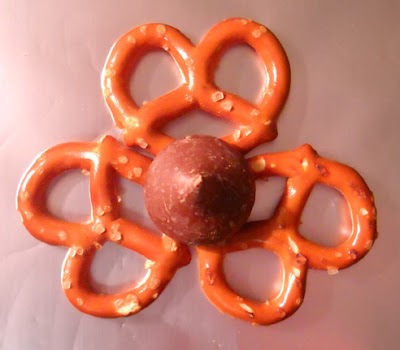 You can even use different color M & M's to make them look like spring flowers. Thanks for sharing. Just made these with my kids! We all loved doing it!!! Good job! I just mentioned your idea on my blog and did my own variation as well. Come check it out. Copyright © 2012. Copyrights, trademarks, and brands are the property of their respective owners. Simple theme. Powered by Blogger.